Ah summer. The days are longer, hotter, and there is always something to do! Parties, lounging by the pool, sitting around a fire, a motorcycle ride with the wind in your hair, or just kicking back in a comfortable chair on the deck listening to some music with a sweating glass of adult goodness in your hand. In swaggers the Porch Swing cocktail. It’s simple. It’s got class. The dudes on Boardwalk Empire in their fancy pants are drinking up one of it’s ingredients! Me? I’m drinking it on the deck under the shade of an umbrella, in my tank top and flip flops, busting out the hand jive movements of this video (I’ve also caught myself doing it in the car…comedy on wheels for the other cars on the road with me!) I’m pretty sure this album is going to be my summer 2012 soundtrack. Yep. Now, I bet you’re wondering where in the hell I found this Porch Swing at. Well, after much googling of cucumber infused drinkage, I stumbled upon this and thought ya, I have got to try this. 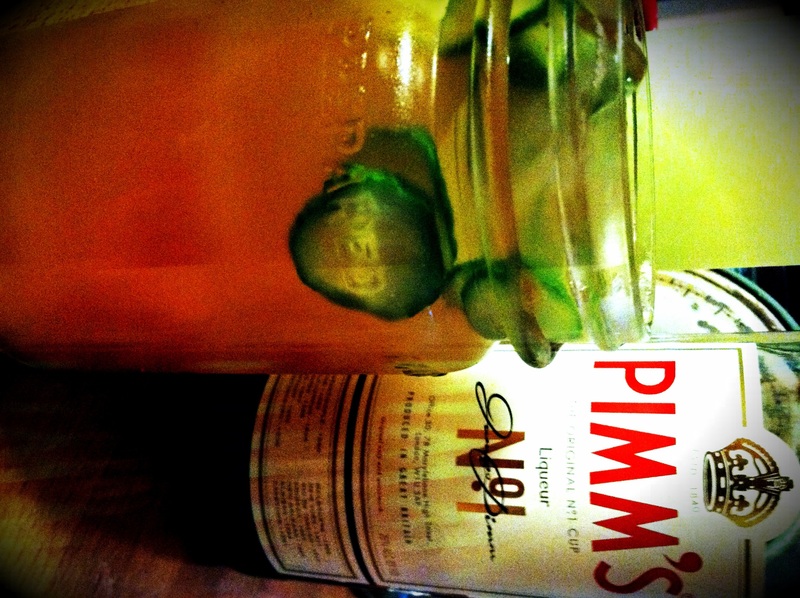 I had never previously heard of Pimms #1 Cup. So I searched. I called liquor stores – only some of them had this old school booze. I bought a bottle. I whipped some of these up. I went back the next day and purchased another bottle because I knew it was going to be our summer sipping drink of choice. I tasted the Pimms straight up. I decided mixing it as a Porch Swing was my thing. That was 2 summers ago. Now into our 3rd summer, it’s back. It’s perfect. This is MY twist on the original link. I don’t make from fresh lemons lemonade. I use bottled lemon juice. Ya, it’s cheating, but when you are drinking these with the hubs and you are each having 2, maybe 3, that’s a whole helluva lot of lemons to go through for fresh squeezed. I’ve done it that way, and honestly, there is no difference. None. Once you add in all the other stuff, noone is going to be able to tell you didn’t squeeze those lemons yourself. And I use plain old selter or soda water for the touch of fizziness. I had to make this porch swing my own. Do your thang! Start out by making some ‘fresh’ lemonade. mix all the ingredients together until combined. English cucumber (seedless cuke) sliced into paper thin slices – about 10 per glass – DO NOT USE A REGULAR CUCUMBER!!! 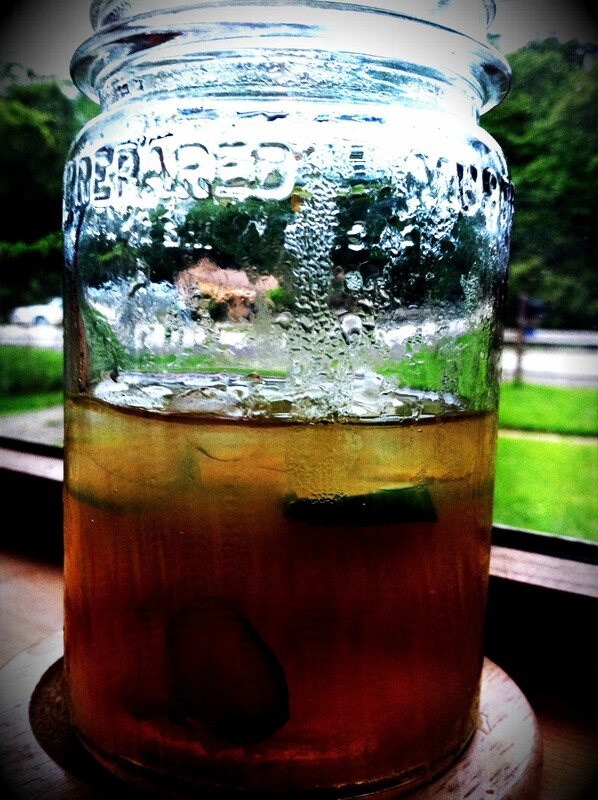 Fill a glass with ice (I used a pint mason jar. duh). Fill 2/3 of the way with lemonade. Add 1 1/2oz Pimms #1 Cup. Add a splash of gin ( I used Seagrams) and a splash of selter/soda water. Add about 10 of those paper thin cucumber slices. Stir to combine everything and enjoy!